(Nanowerk News) Massachusetts General Hospital (MGH) investigators have induced structures incorporated within individual cells to produce laser light. The wavelengths of light emitted by these intracellular microlasers differ based on factors such as the size, shape and composition of each microlaser, allowing precise labeling of individual cells. The researchers' report has received Advance Online Publication in Nature Photonics ("Intracellular microlasers"). "The fluorescent dyes currently used for research and for medical diagnosis are limited because they emit a very broad spectrum of light," explains Seok Hyun Yun, PhD, of the Wellman Center for Photomedicine at MGH, corresponding author of the report. "As a result, only a handful of dyes can be used at a time, since their spectral signatures would overlap." Lead author Matjaz Humar, PhD, also of the Wellman Center, adds, "The narrow-band spectrum of light emitted by these intracellular lasers would allow us to label thousands - in principal up to a trillion - of cells individually, and the very specific wavelengths emitted by these microlasers also would allow us to measure small changes happening within a cell with much greater sensitivity than is possible with broadband fluorescence." 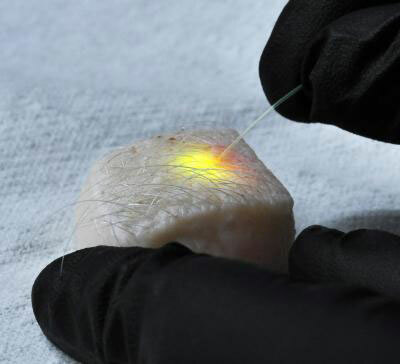 Previous studies by Yun's lab demonstrated the first laser based on a living cell, which used fluorescent proteins as the gain medium to amplify the light signal. But this first-generation cellular laser required a laser cavity consisting of a pair of mirrors placed outside the cell to generate laser light. For the current study, Yun and Humar used tiny spherical objects capable of confining light by reflection from their inner surfaces as microcavities for the amplification of laser light within the cavity. The first versions used droplets of oil - either injected into individual cells or naturally occurring within the fat cells called adipocytes - and showed that either could be induced to emit specific wavelengths of laser light by pumping energy from an external laser into fluorescent dyes diffused into the droplet, a process that produced minimal heating of the cells. Changes in the shape of the droplet induced by miniscule pressure alterations within the cell altered the spectra of light emitted, and those alterations could be readily measured. Along with showing lasing with a variety of cells - such as cancer cells, fibroblasts, macrophages and adipocytes extracted from the skin of pigs - the researchers also induced adipocytes residing within a piece of porcine skin to emit clearly visible laser light. Production of laser light within solid plastic fluorescent microbeads, which are readily taken up into cells, resulted in unique signature spectra based on the size and number of beads within a cell and the fluorescent dye used. The investigators calculated that it would be possible to tag individual cells with more than a trillion different laser signatures, a number that matches the estimated number of cells in the human body. "One immediate application of these intracellular lasers could be basic studies, such as understanding how cells move and respond to external forces," says Yun, an associate professor of Dermatology at Harvard Medical School. "Another challenging step will be figuring out how to use biologically generated energy from mechanical movement or a biochemical reaction to pump a cellular laser in a living body. Cells are smart machines, and we are interested in exploiting their amazing capabilities by developing smart-cell lasers that might be able to find diseases and fire light at them on their own. We can envision lasers completely made out of materials that are safe for use within the human body, which could enable remote sensing within the body or be used in laser-light therapies."